“This budget represents hope for our state. Members from all four caucuses came together to make difficult choices and find a compromise that would bring certainty and stability back to Illinois. “My measure, Senate Bill 2577, or the Marketplace Fairness Act, is also included in the budget. This will bring revenue to our state because it ensures out-of-state online companies pay their fair share of taxes, just like local brick-and-mortar business owners do. “I voted for this budget, not only because it was truly balanced, but because it funds the services many people in my district rely on. Under this budget, services such as domestic violence shelters, mental health programs and childcare and immigration services are able to get the funding they need to keep their doors opened. “Our budget restores certainty for pre-kindergarten through 12th grade with the new evidence-based school funding model which guarantees no school district will get less funding than the year before. We can let out a sigh of relief knowing that our schools will open on time. “After holding higher education hostage for over two years, this budget provides our colleges and universities with a 2 percent increase while also funding MAP Grants and a new Military Veteran Scholarship that will be distributed to public institutions based on their level of veteran enrollment. That will give Elgin Community College over $50,000. “The budget also gives middle class students a chance to pursue a higher education in our state through the new pilot grant program, AIM HIGH. Illinois will match the funding to public universities that award scholarships to students based off of not only their financial need, but their merit. This will help keep students in our state. The budget package will move to the House for consideration before heading to the governor’s desk. House Bill 4100 passed both the House and Senate and moves to the governor’s desk for consideration. 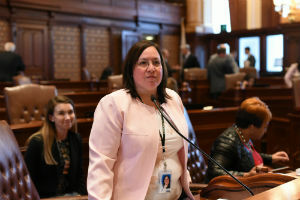 SPRINGFIELD – Both the Illinois House and Senate advanced legislation sponsored by State Senator Cristina Castro (D-Elgin)yesterday to create stronger penalties for texting and driving. Under current law, first offenses of texting and driving are treated as non-moving violations. With House Bill 4846, a moving violation will be noted on the motorist’s driving record, along with fines and court costs. 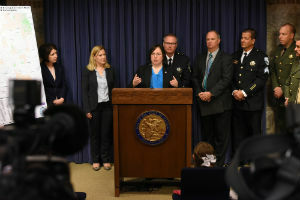 Last year, Castro passed Senate Resolution 322 to establish an Illinois Distracted Driving Awareness Week. This piece of legislation will crack down on the epidemic in a more forceful way. 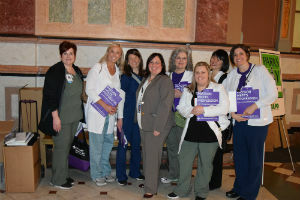 House Bill 4846 passed both the House and Senate and now moves to the governor’s desk for consideration. Employers can currently consider salary history when making hiring decisions and salary offers. This perpetuates wage inequality, especially since women, on average, earn less than men for similar work. It has also been found that women of color earn even less than white women when compared to men. 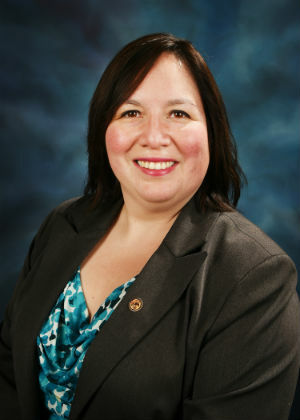 House Bill 4163 passed both the House and Senate and now moves to the governor’s desk for consideration.